In this monthly interview series, EDN focuses on one of its many members to show both members in the spotlight and the diversity of the EDN membership group. Our EDN member of the month for September 2018 is Pailin Wedel, filmmaker and founder of 2050 Productions, Thailand. EDN has among other things talked to Pailin Wedel about her current project Hope Frozen and the situation for documentaries in Thailand. Pailin Wedel grew up in Asia and began her career as a photojournalist (stills) in 2004 at a newspaper in the U.S. She quickly fell in love with video narratives and taught herself video production. In her spare time, she teaches short courses on video and mobile journalism and contributes to the acclaimed Instagram feed @everydayasia. Pailin works on documentaries that focus on themes of faith, trauma and adaptation to the modernity. Aside from her television work with channels including Al Jazeera English, she also films pieces for The New York Times, National Geographic and Monocle. Before diving into the freelance, she was the Asia Interactive producer for the Associated Press where she directed online visual and interactive coverage for the region. EDN: Can you start by telling more about your background and your road into the world of documentaries? PW: I grew up in Asia: Thailand, India and Singapore to be exact. My father is American and my mother is Thai. So I’ve often found myself in situations where I had to be an interpreter of both language and culture. Communicating visually can break so many cultural and language boundaries. But I didn’t realize how much I enjoyed taking images until I picked up a photojournalism minor in college and worked as a stills photojournalist at newspapers. I learned how to shoot video when newspaper websites started taking video stories seriously. First, I was turning in the standard three-to-five minute news features for outlets such as the New York Times or National Geographic. But as time went on, I became more frustrated how little time I was given to explain such a complex region. Six years ago, I started pitching to Al Jazeera’s 101 East current affairs half-hour documentary program and have been regularly contributing them since. Hope Frozen is my first feature-length creative documentary film. Stylistically, it is a big departure from my usual reportage work. But in terms of length, it seems like I’ve been gradually heading towards this feature-length path for a while. EDN: You are one of the founders of the production company 2050 Productions based in Bangkok. When did you launch the company and what was your motivation for setting it up? PW: I’ve been pitching documentary stories for a few years now and I’ve found that more funding options were available to me if I had a company. So I founded 2050 with my husband. Patrick Winn, in 2016. EDN: What is the profile of 2050 Productions? Do you work with both docs and fiction and how do you find the projects to work with? PW: 2050 Productions is a small documentary team based in Bangkok. The operation is primarily focused on Southeast Asia. We’re rabidly curious people who obsessively chase powerful factual stories. We’re journalists, first and foremost, but we seek to rise above Western journalism’s worst habits. In lieu of reports hastily assembled from cheap stereotypes, we try to present our subjects with complexity. Covering Asia in the 21st century is really a privilege — and we take pride in illuminating the lives of people who are too often ignored. As for our name - 2050 alludes to the year 2050, right in the center of the unfolding Asian century. Human civilization’s center of gravity is moving east — and yet Western societies still fail to grasp the immensity of this shift. So we’re here to tell Asian stories, decipher Asian conflicts and expose the often-overlooked links between Asia and the West. Our storytelling offers a glimpse at the world to come. EDN: You and your company are based in Thailand. Can you share some insights into the documentary environment in Thailand? Is there funding available for documentaries and are documentaries screened in cinemas and/or on TV? Are there organisations and training possibilities for documentary filmmakers? PW: I truly believe we have some of the most talented filmmakers in the world here in Thailand. We have a very strong fiction tradition and an emerging documentary filmmaking community that is growing rapidly. The Documentary Club Thailand has been instrumental in distributing creative documentary films and educating the public about the different types of documentaries. I try doing my part by screening documentary films once a week at the Foreign Correspondents’ Club of Thailand. For many Thais, ‘documentary’ means specialist factual docs such as nature, travel or educational documentaries. Few have been exposed to creative narrative documentaries. I can’t think of a slot on Thai TV that carries creative docs. But there’s a whole channel dedicated to specialist factual docs. Funding is tough all around the world. But it’s especially tough here. There are a couple of government grants each year but projects need to include elements that promote Thailand in some way to satisfy the requirements. There’s a new film fund called Purin Pictures that supports independent films from Southeast Asia that is very exciting. Docs by the Sea has been a very effective incubator for Asian projects. And there are also a few pitches and funds in Korea and Japan with Asia categories that Thai filmmakers can rely on. If you have a specialist factual film, then there are many channels that will commission and some even co-produce here in Thailand. But budgets are a fraction of what East Asian or Western channels have. If you have a creative documentary, many filmmakers rent out independent theaters and make back their budget in ticket sales. I relied on foreign funding and pitch forums to make Hope Frozen. EDN: You are currently finalising Hope Frozen, which last year won the prestigious “The Whickers Funding Award”. What is the film about? PW: The film is about a two-year-old girl from Bangkok — nicknamed “Einz” — who becomes the youngest person in the world to undergo cryo-preservation. After her death from brain cancer, her father, a Buddhist laser scientist, convinces his family to send the girl’s body to an American lab. Her head and brain now rest in a cryonic tank in Arizona. His dream is to help her consciousness reawaken, so to speak, in a new synthetic body many decades from now. Hope Frozen follows the family who made this life-changing decision. The film weaves personal footage of the girl’s life with observational scenes of the family following her death. It explores the technology that promises to preserve the human mind — and the emotional struggle of a family devoted to reviving their daughter at all costs. EDN: Can you share some insights from the road from idea to finalized film? How was the journey? PW: The real journey is in finding other creatives (and funders) who share your vision. All of my crew and post-production folks worked for free or a reduced rate in the beginning. Those who became financial supporters of the film really understood Asia and how this film from my small country could connect with the world. There were a lot of challenges. I’m a first-time feature-length filmmaker from Thailand. Nobody knew me in the creative documentary circuit. The funding environment in Southeast Asia is really tough. Then there’s the ethical complexity of the issue: the “foreignness” of the film for Western audiences, the fact that it deals with death, which is taboo in many countries. It’s a highly emotional film that’s mostly in a foreign language. This isn’t the easiest project to get off the ground. But I believe all of these challenges are also the film’s best qualities. And I kept believing that because I’ve been supported by my team, my mentors and fans of the project that I’ve met along the way. It is a unique film. I don’t know of another film that looks at humanity’s growing faith in science in the same hyper-personal way. It’s a film that gives you a first glimpse of how technology is changing the way we grieve. Those who became our supporters shared this vision. The project was selected for EDN’s Crossing Borders development program. After being invited to pitch at six different forums, I won “The Whickers Funding Award” at Sheffield Doc/Fest. Then I won pitches at Tokyo Docs and Asian Side of the Doc. And then our co-producer Bili Bili, an online platform in China, came on board. All of this happened very quickly after I won “The Whickers Funding Award”. The award was essential in the making of the film. We’re now looking for pre-buys and acquisitions. And we are very optimistic. EDN: As mentioned you took part in Crossing Borders in 2016 (the Asian-European training program run by EDN and Documentary Campus) when Hope Frozen was at an early stage. What did it mean for you and the film to take part in the program? PW: Crossing Borders taught us very tangible pitching and budgeting skills and gave us access to some of the industry’s top decision makers during the Leipzig Networking Days. But the most important aspect were the friends I made from that program. My coaches became my mentors. My peers became my cheerleaders. Without that early support, the film would have been much harder to make. EDN: Besides developing and pitching your film at Crossing Borders you also got a network of new colleagues. Can you tell us more about what this led to? PW: The first portion of the Crossing Borders program was conducted in Korea and the second half in Leipzig, Germany. It was at the Korean portion of the program where I met Sona Jo, a Korean producer. She and I were chit-chatting about the backlash against feminists in Korea and the increasingly boisterous men’s rights groups. We both found the issue important and fascinating. So after some research, we pitched the idea of a documentary on the topic to Al Jazeera’s 101 East. 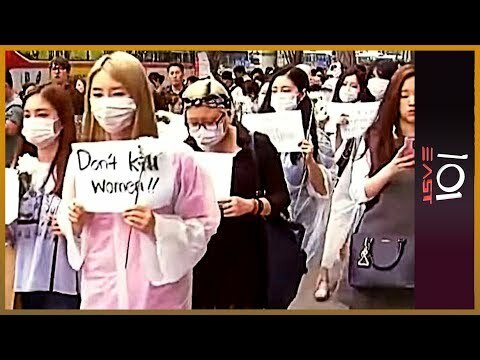 The piece “South Korea’s Gender War” was broadcast in April 2017. The film has been viewed online more than 250,000 times. If you’d like to see it click here. Crossing Borders put passionate people in the same room and the magic just happened: a Thai director collaborated with a Korean producer and made a film about feminism that was broadcast worldwide! EDN: Last but not least - what lies next for you, Hope Frozen and 2050 Productions?